The highlight of the past few days would have to be the 515 Alive festival here in downtown Des Moines on Saturday night. Compared to the higher-profile 80/35 earlier this summer, this free event skewed younger, with lots of high school kids walking around. Hardly a crowd worthy of the kind of fun-hating done by local business owners last week (I didn't stay until the end, but "drunkfest"? Have you been out on a weekend night around my building lately? No comparison). 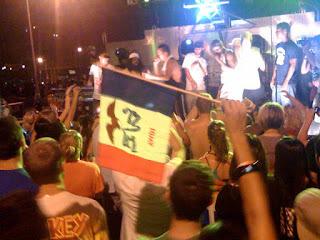 No way I would've been allowed to go to something like 515 Alive when I was 15 or 16, but man, it must've been an exciting experience for those kids-- out in the downtown at night, dancing under the stars to music you'd usually have to be 21 to check out at a bar or club, if you even knew where to find it. I tried to put myself in their frame of mind. Three stages-- the middle one felt the hottest, so we mostly stuck to the main stage and the techno stage at the opposite end of the event. (Oh, and there were people performing in a few of the local bars, too, but with everything looking too crowded-- last year's event brought out 14,000-- we braved the muggy heat outdoors.) At the techno stage, we saw a couple of DJs spinning some relatively minimal, straightahead stuff, beneath an empty building with a flashing applause sign in the window. Wish I caught their names, but the first guy did a great job of letting the beats build, so you'd get peak after peak and hands would go into the air. The second guy would just sort of alternate between peaks and valleys, but the beer must've been flowing because there always seemed to be someone who was really feeling it. Over at the main stage, I actually caught the performers' names. Journalism! Jurassic Five apparently split up, but former member Akil the MC made the trip to Des Moines in support of a new solo album, Soundcheck. I can freely admit the things that separate Akil's music from some of my favorite rap: It looks backward rather than forward, it means exactly what it says without a hint of mischief or wordplay, and it can be super preachy. But I'm not gonna pretend he didn't put on a charming, good-time show the other night. Akil seemed sort of sad and uncertain without his group, and that vulnerability made him more likable-- you felt like he actually wanted to be here. It didn't hurt that he kept shouting out Iowa, with a hint maybe of effort but not sarcasm. We got to the stage right in the middle of Jurassic Five's "I Am Somebody", and Akil-- now backed by the DJ from his pre-Jurassic crew-- also briefly did an a cappella snippet of "Concrete Schoolyard" (I guess the whole song is a little too group-centric to fit in at a solo show, bummer). All in all, lots of old-school beats and unbridled positivity. Local MCs came up to join Akil on stage to show off their stuff, and the highlight had to be when one woman opened her mouth and sang in a gorgeous gospel voice instead of reciting her (in one would-be Asher Roth's case) crisply delivered but not exactly spontaneous-sounding verses. Akil did new stuff, too, including one song based around the whole "one for the money, two for the show..." shtick. Not so great, but it was an uncritical kind of evening and any musical shortcomings couldn't dim the overall enthusiasm. Akil later came back to do a verse with local funksters Cleo's Apartment, who were fun to dance to and had a lead singer whose hairdo and tie gave her a space-age look reminiscent of Janelle Monae. Never did see the Jungle Brothers, though... anybody have a recap? Christopher the Conquered, Casper & the Cookies, Nuclear Rodeo, and Bradley Unit and the Members played at Vaudeville Mews on Thursday night, and I was there, too. I don't really feel like I retained enough observations from that night for a thorough review, but I was pleased by Bradley Unit's wry, low-key jangle-pop, complete with a cover of my beloved Scottish group Belle and Sebastian. I realized I had seen Nuclear Rodeo before-- catchy power-pop, highlighted by a song about Iowa's own Shawn Johnson. Athens, Ga. power-poppers Casper & the Cookies were energetic performers with lots of stage moves, and I know they've toured with Ames band the Poison Control Center, but the crowd was REALLY thin this night, and I gotta say I don't remember any of the songs well enough to run out and bring everybody I know next time-- maybe I just wasn't in the right mood. And locals Christopher the Conquered headlined, with a fine set of piano pop that culminated in a ballad for singer Chris Ford's girlfriend, away in Chicago that night. The PBR was getting to me by that point, but I seem to recall Chris (who is a reader and a nice dude, so in other words someone difficult to write about objectively) coming out into the crowd and singing that one from the floor. Which is about where I want to be right now, unless I can make it as far as the bed. Atmosphere tomorrow night at Simon Estes, and I'm already definitely going to see Jamey Johnson at the State Fair. Caught the I-Cubs on Friday, too, but you don't need a recap of that (they won!). What else is going on? This post would've been a lot more interesting if I had taken pictures as I was people-watching on Saturday night. Really varied crowd that night, from hippies to just about everybody else. The common thread was people looking like individuals-- always refreshing.